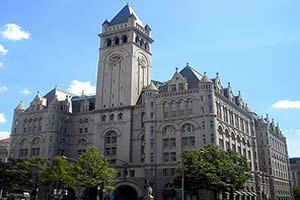 The Old Post Office Pavilion is a historic building located at 1100 Pennsylvania Avenue NW. Completed in 1899, it was used as the city’s main post office until 1914. Used primarily as an office building afterward, it was nearly torn down during the construction of the Federal Triangle complex in the 1920s. It was nearly demolished again in the 1970s. Since then leased to the Trump to renovate into a hotel.